To close the series of articles on how to choose you needles and techniques to knit small pieces in the round, I asked Fanny to present us her method for knitting two socks at the same time with double-pointed needles. When you start to become interested in knitting socks, you’ll soon be told about a scary disease that seems to affect the majority of the population: the SSS a.k.a the “Second Sock Syndrome“. 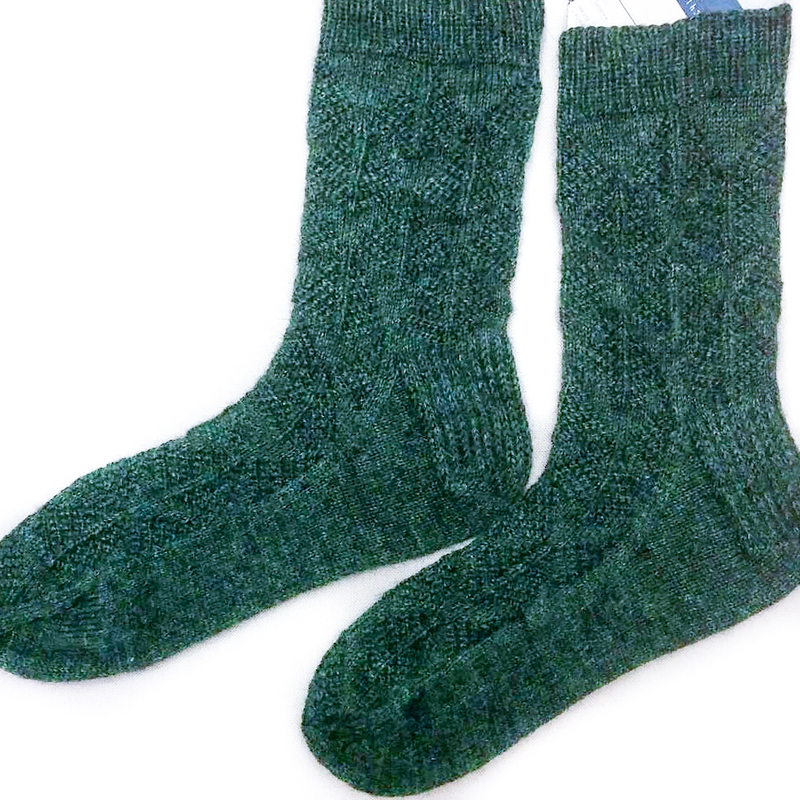 A few lucky knitters are not at all bothered by this concern and others decide to go around by choosing two different patterns with the same wool to make coordinated rather than matching socks. Most of us decide to use a technique with the barbarous name of 2AAT whose name simply means “2 At A Time” or “2 at once”. But, this is reserved for magic-loop user (a technique which uses circular needles, and which we have already mentioned here and here), bummer! 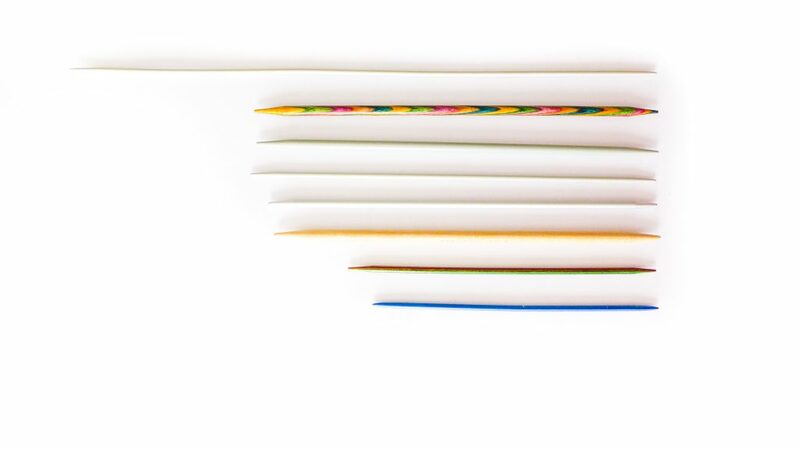 Personally, I’m addicted to double pointed needles (DPNs) and I only use magic loop only under duress. But I’m also of the kind of knitter who dislike knitting several times the same thing (just at the thought of the sleeves waiting for me on my WIP sweater, I’m depressed – Chloé: ha, ha! We should host a sleeve KAL one of these days! I still have two sweaters waiting for their sleeves too. Any candidates?) and therefore an easy target of the terrible SSC! Am I to even forced to give up socks (Never! Socks and me, it’s for life! ), having different socks (I’m way too maniac for that, with rare exception if it is planned), having a pile of single socks waiting for me (and not being able to wear them? Snif snif) or to convert me to the magic-loop (aaaargh!)? How to 2AAT with DPNs? Surely not! To be able to indulge my passion for socks with total peace of mind, I invented an ultimate and very simple technique to say farewell to the SSS, while keeping my faithful DPNs. I am convinced that a lot of knitters are already doing this – and that nobody has the idea to call it a technique (and even less to say they made it up ) – , but as I never crossed anybody else who’s doing it like that, I think that it’s worth talking about it. Unlike with 2aat with the magic-loop, there is no constraint on the pattern: you can have sts travelling fron the front to the back, from the back to the front or dancing java, it doesn’t matter. 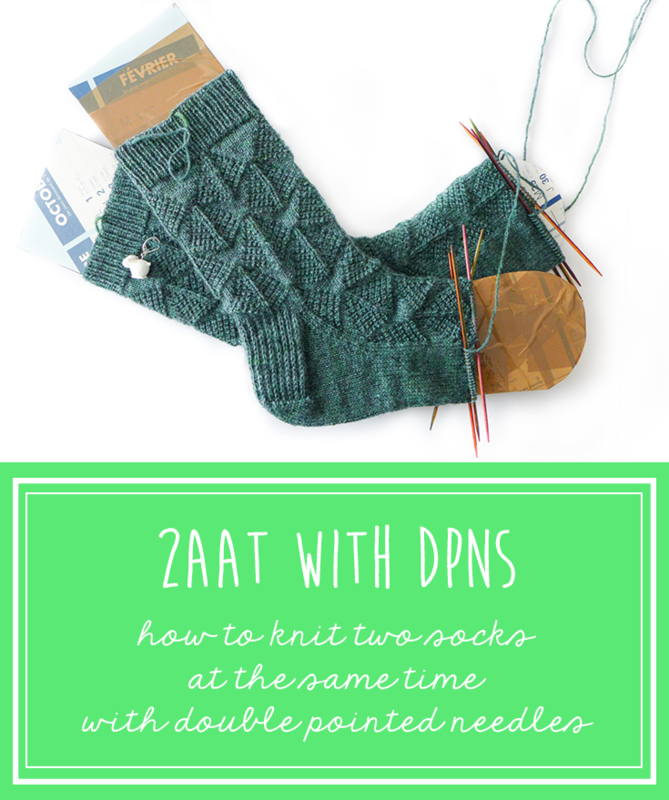 If you can do your socks on DPNs, you can use this technique. However, this very simple technique has a drawback: it requires 2 sets of DPNs of the same size. I see that some of you already pictured the trick and look up at the sky… I told you it was simple! Indeed, you simply work a section of sock A then the same on sock B, then knit the following section on sock B (because you’ve got your hands on it) and then go back to sock A, etc. Tadaaaaaaaaam, here’s my big secret to withstand the SSS! Yes, it’s far from being a life changing trick and this will not impress your neighbors, but if you finish the first sock and you only have the other toes to knit (or the ribbing, depending or your pattern), I can guarantee you’ll have a burst of motivation and you’ll finish this second sock at once! How to slice things up? The size of the sections will depend on a lot of you and the pattern. Some may prefer to do a few rows at once (for example if you only have minutes ahead to knit) and others will want to knit larger ones (to save time and avoidind switching socks and needles to often).